"Bringing your Concepts and Ideas into production"
Ashish Tools has developed a well versed and a versatile Design and Development center to keep up the company with the international trends. R & D activities here are conducted through a young team of professionals facilitated by latest assembly/testing and calibration equipment's from world renowned manufacturers. This helps us to provide customer satisfaction in bringing their concepts and ideas into production. 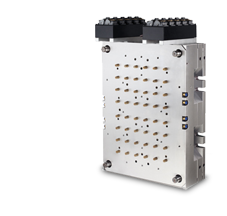 Technically embedded cooling channel & turbulent water flow ensure consistent cooling and efficient heat transfer for high quality preforms. Optimized heat distribution results in consistent AA levels across all cavities. Ashish Tools offers a process optimization service that can improve preform quality, reduce cycle time and add functionality to the product.